DBS is looking to increase awareness of its new DBS Singapore Gallery and has launched a new campaign to do so. 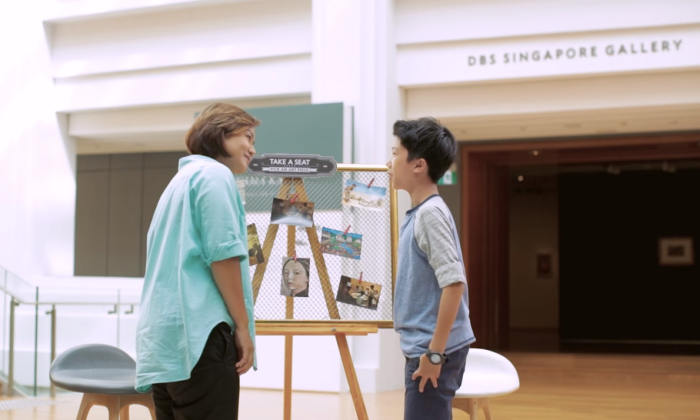 The local brand has invited six Singaporeans to the DBS Singapore Gallery, where they were each paired up to take part in the “Take a Seat, Pick an Art Piece” story-sharing social experiment. The participants were intentionally paired up with someone of a different background. Inspired by the iconic paintings in the gallery, they found themselves sharing some personal life experiences and perspectives with one another. For example, David Lim, a 70 year-old first-generation SAF officer, and 24-year-old Anand Ravindran, a former NS policeman, had an interesting conversation about National Service and how it has changed over the years. Mumi Mastan, who grew up in a Malay-Peranakan household, and 13-year-old Nathaniel Liauw (pictured), who spent most of his schooling days in Malaysia, discussed how education has evolved over time, and recounted experiences of what it was like to attend school in different countries. The participants were guided by art pieces that chronicle Singapore’s development and the impact of cross-cultural influences, from Chua Mia Tee’s “National Language Class”, Liu Kang’s “Life by the River” and Ho Kok Hoe’s “Conversation”. The six Singaporeans were led share their hopes for Singapore in the future. Alipay recorded an average per-capita spend of RM635.97 in Malaysia during the three-day annual May Day holiday celebrated in Chin..
"Back in the day, business was pretty much non-existent. "..